Illustrator: How to quickly reset text styling? 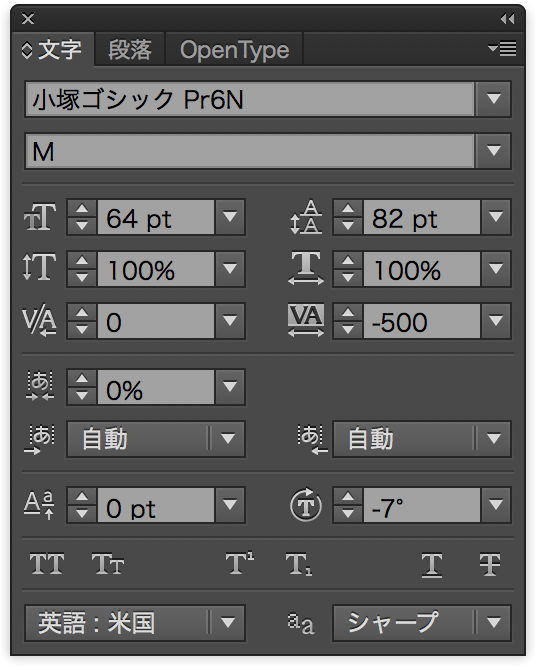 Upon placing a new text object, Illustrator uses whatever styling was used on the last text object you had selected. This can be annoying in some cases. For example, I've made some extreme changes to the kerning, line spacing, and character rotation that made sense for one specific text object, but I don't want these settings on my newly created text. Surely there must be a quick way to reset these to their defaults without having to dial in each value one by one? In addition to the panel menu of charecter palette: You can shift click on the normal character/paragraph style in character/paragraph styles palette. This should return you to the default style with no bells and whistles. The benefit of this is also that by using this palette you get into the habit of using styles. Open the panel menu by clicking the menu button in the upper-right of the Character panel. Click on Reset Panel. Not the answer you're looking for? Browse other questions tagged adobe-illustrator text formatting character-styles or ask your own question. Why does Illustrator not let me edit text after it has styling? How to quickly change multiple colors in the same text area? Illustrator : how do I see the sequence of transformations that are applied to an object?